The T-1 wheels on this page are designed to operate on electric and pneumatic die grinder type tools. Operators must obey the maximum RPM speed ratings, and use a tool guard. Use proper arbor mounts. Arbor mounts are shown at the bottom of this page. 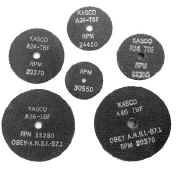 The wheel grades on this page are good for most general purpose metal cutting. Click right below for other styles. Wheels for Dremel style tools. Larger quantity orders will be quoted. Email us. Download a printable PDF safety sheet . Arbor mounts for wheels 4" diameter and under.